Victory for bees in Europe! Copied in full from an e-newsletter from Avaaz. We did it — Europe just banned bee-killing pesticides!! Mega-corporations like Bayer threw everything they had at this, but people-power, science and good governance came out on top!! Keeping France strong. 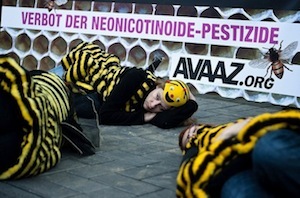 In January 2011, 1 million people sign our call to France to uphold its ban on deadly neonicotinoid pesticides. Avaaz members and beekeepers meet the French agriculture minister and fill the airwaves, pressing him to face down fierce industry lobbying and keep the ban, sending a strong signal to other European countries. Tackling industry head on. Bayer has faced Avaaz and allies protesting at its last three annual meetings. The pesticide giant’s managers and investors are welcomed by beekeepers, loud buzzing, and massive banners with our 1 million plus call on them to suspend use of neonicotinoids until scientists reviewed their effect on bees. Avaaz even makes a presentation inside the meeting, but Bayer says ‘no’. Making the science count. In January the European Food Safety Agency finds that three pesticides pose unacceptable risks to bees, and we jump in to ensure Europe’s politicians respond to their scientific experts. Our petition quickly grows to 2 million signatures. After many talks with EU decision-makers, Avaaz delivers our call right to the EU HQ in Brussels. Later that same day, the Commission proposes a two-year ban! Seizing our chance. The battle to save the bees heats up in February and March. Across the EU, Avaaz members are ready to respond as all 27 EU countries decide whether to welcome or block the proposal. When farming giants UK and Germany say they won’t vote yes, Avaaz publishes public opinion polls showing huge majorities of Brits and Germans in favour of the ban. Avaaz members also send almost half a million emails to EU Agriculture Ministers. Apparently afraid of dealing with citizens rather than industry lobbyists, UK minister Owen Paterson complains of a “cyber-attack”, which journalists turn into a story in our favour! And then comes Bernie — our 6 metre bee in Brussels — a powerful visual way to deliver our petition as negotiations enter the final stages. Journalists flock to Bernie, and we hear we’ve helped get the Spanish ministry to look harder at the science and shift position . But we didn’t get the majority we needed to pass the ban. Turning the red light green. In April the bee-saving proposal is sent to an Appeals Committee, giving us a glimmer of hope if we can switch a few more countries’ positions. 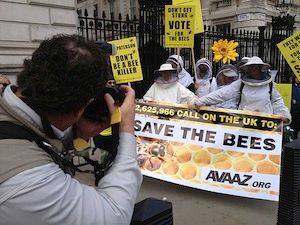 In the final sprint, Avaaz teams up with groups including Environmental Justice Foundation, Friends of the Earth and Pesticides Action Network, plus beekeepers and famous bee-loving fashion designers to organise an action outside the UK Parliament. In Germany, beekeepers launch their own Avaaz petition to their government, signed by over 150,000 Germans in just two days and delivered in Cologne soon after. More phone calls rain down on ministries in different capitals as Avaaz responds to a last-minute wrecking amendment by Hungary, and positions Bernie the bee again in Brussels. Pesticide companies buy adverts in the airport to catch arriving officials, and take to the airwaves suggesting other measures such as planting wild flowers. But their slick messaging machine is ignored, first Bulgaria then — the big prize — Germany switch their stances and this week we win, with over half of EU countries voting for the ban! It’s been a long haul, to get this win, and it wouldn’t have been possible without scientists, specialists, sympathetic officials, beekeepers and our campaign partners. We can be proud of what we’ve helped to accomplish together. This entry was posted in Health and well being, Mother Earth and tagged mindfulness, well being, wholeness. Bookmark the permalink. 10 Responses to Victory for bees in Europe! Yay! I hope this happens in the US someday too! oh, I hope so too. It will require the same effort that the Europeans made, however. They fought, showed up, demonstrated, as well as signed petitions. Tell me where and I’ll be there! Even here in rural Massachusetts surrounded by mostly organic or pesticide-free farms, we’ve had minor collapses. 5 years ago, no honey bees roamed whereas the years before that were normal. Then after two years, almost one by one, they started to be visible again. I cried with joy with the first single honey bee’s return. May we collectively understand the gravity of this and act appropriately. I know, I’m always really happy when I do see bees (wasps on the other hand, not so much – they’re nasty! ;)). They’re beautiful. I’ll sound weird but I had a brief obsession with bees when I was a kid! Are you a bee keeper? I’m not physically able to do that (MS) but a fellow resident here at Spirit Fire wants to. Maybe there is someone nearby who is keeping bees and you could help out once in a while. Aquarian Age and all! I like the way you think! Definitely something to think about. I’d kinda love to live in an eco community one day….